Wasn’t it great news to learn the contest to find all the clues contained in a book about the War of 1812 by Dennis White has finally been solved! Now the Windsor Public Library has its own mystery we hope the public can unravel. 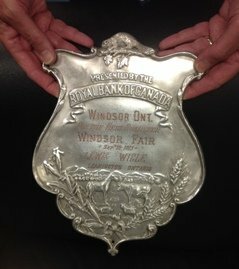 Although Windsor is known as an automotive city, Local History Librarian Tom Vajdik believes the prize winning roadster was not a Tin Lizzie or another motorized vehicle, but rather a class of horse. Both the United State Equestrian Federation and the online magazine Saddle Horse Report, still recognize Roadsters as a division in horse competitions. As for the winner, Lewis Wigle, three similarly named people resided in Essex County in 1913. If there are family members who remember a grandfather or great uncle being awarded this prize, we would love to hear from you. Please call the Local History office at the Central Branch of the Windsor Public Library at: 519-255-6770 ext. 4437.